Everglades Holiday Park Review by Paula Bendfeldt Diaz | Everglades Holiday Park: Experience the Excitement of the Eveglades & Save with Discount Coupons! My family and I love exploring Florida. There is nothing better than learning about all the exciting and interesting things here in the sunshine state and making memories by getting to know our own back yard. We specially love to learn more about the unique environments and the rich natural beauty of Florida. Although the Everglades are close by we still have not gotten the opportunity to experience this amazing ecosystem up close. We have planned to take an exciting Airboat Tour with Everglades Airboat Tours and The Gator Boys at Everglades Holiday Park. The Everglades Holiday Park located near Fort Lauderdale is home to the Gator Boys from the Animal Planet show. Most episodes are filmed right in the world-famous Everglades park filled with alligators! This is a perfect family trip and my kids are looking forward to riding an airboat for the first time and meeting the Gator Boys. There’s even a good chance that while ‘re here visiting, you’ll see the Gator Boys filming. 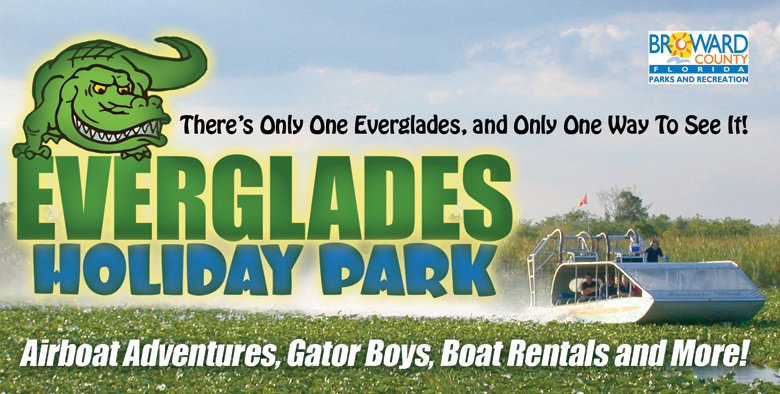 Right now you can take advantage of a limited time offer – SAVE $4 Off Adult and $2 Off Child Airboat Tour Ticket – Everglades Holiday Park — home of the #GatorBoys #evergladeholpk. Get your disc out coupons HERE. This coupon is valid until 8/31/14! Everglades Holiday Park was just recently voted the #1 theme park in South Florida in the 2014 WPLG-Miami “Top Ten” competition. It’s the official home of the Gator Boys in the Everglages and you might even have a chance to meet them! So if you like the show and would love to experience the excitement of an airboat ride, the natural beauty of the everglades and a once in a lifetime experience watching alligator wrestling you should not miss this opportunity to save on tickets to Everglades Holiday Park. To learn more About Everglades Holiday Park you can visit their EvergladesHolidayPark.com, like https://www.facebook.com/EvergladesHolidayPark and follow @EvergladeHolPk on twitter. You can also register for Birthday Deals HERE!